Andrew Lincoln played Rick Grimes in The Walking Dead for the last time, but he isn't done with the character. Scott M. Gimple, executive producer of the series, announced that Rick Grimes' story will continue. "This is not a weird trick. This is the end of Rick Grimes on Walking Dead, but this is not the end of Rick Grimes' story," Gimple said. "We are going to continue telling Rick Grimes' story in a series of AMC original films. There's a lot of story to tell. And we can't wait to get started and show you all the stuff. "We're going to make AMC original movies," Gimple said. "It expands the universe. It's going to show a whole different corner of the world. It's going to show a different situation that Rick is involved in. "These are going to be shown on AMC right now, but they're going to have the scope of feature films." Gimple said The Walking Dead will be presented in different formats -- including digital -- and viewers will see dead characters. Stories will take place in the past, present and future. "It's a very long-term plan. We're not going to throw all of this at you guys at once," Gimple said. 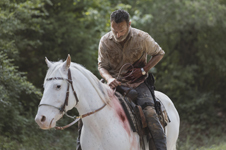 ""Some of it will be interconnected and some of it will be on its own," Gimple said. Sunday's episode ended with an injured Rick Grimes blowing up a bridge to save the survivors from a gang of zombies. He was then picked up in a helicopter, leaving everyone to believe he died in the explosion. Lincoln's involvement in future The Walking Dead projects was not detailed. As far as The Walking Dead show itself, the episode ended with a time jump and Judith picking up Rick's hat and shooting zombies. The time jump included new characters. "it's not the beginning of the end, it's the end of the beginning," Lincoln said. "I like we get to do a bigger story, a wider vista." For covers and five-page previews of Dynamite Entertainment titles arriving in stores on Wednesday, November 7, click on the cover thumbnails or the links below for the individual titles. * BATTLESTAR GALACTICA CLASSIC #1. * ELVIRA, MISTRESS OF THE DARK #3. * JAMES BOND: 007 #1. Valiant Entertainment has announced a Feb. 27 launch for The Forgotten Queen, a new limited series by writer Tini Howard and Amilcar Pinna. "A former foe of the super-team Unity -- War-Monger, who made her first appearance in Unity #18 -- will make her solo-led debut as she ascends from her once-thought final resting place to wreak havoc on the Valiant Universe. "Long ago, the mighty generals of the Mongol Empire rode from Siberia to Carpathia and conquered all who stood in their way. Legends tell of a witch who walked with them, who could infect the hearts of any warriors in her midst with an unquenchable thirst for battle and bloodshed...a War Monger. And now she is walking again. "I'm a sucker for unlikeable women. I'm a sucker for immortal heartbreak. And I'm a sucker for defining a villain. I couldn't resist her," Howard said. "(The Forgotten Queen) is dirty and bloody and mean and ancient and modern. There are fights and sacrifice and kissing. We start on a modern research vessel working hard at sea, and we stick around to uncover what kinds of mysteries sink to the bottom of the ocean..."
"Tini and Amilcar are crafting a sensational story to bring one of Valiant's most powerful and secretly influential characters into the spotlight; she will play a significant role in Valiant storylines to come," said editor Joe Illidge. "The Forgotten Queen is just the tip of the iceberg of what Valiant has planned for 2019, during which we will be celebrating the 30th anniversary of when Valiant Comics was founded in 1989. More announcements are forthcoming, so check back as we dive deeper into the Valiant Universe!" 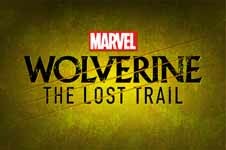 Marvel and podcast listening service and content network Stitcher have announced Marvel's Wolverine: The Lost Trail, marking the second season for the critically-acclaimed scripted podcast series. The 10-episode second season will be available exclusively on Stitcher Premium starting in winter 2019. It will be released widely across all podcast platforms later in the year. Following Marvel's Wolverine: The Long Night, Richard Armitage will reprise his role as Logan in Marvel's Wolverine: The Lost Trail. "Marvel's Wolverine: The Lost Trail is an epic quest that takes place in the Louisiana bayou. Following the events of Marvel's Wolverine: The Long Night, Logan returns to New Orleans in search of redemption, only to discover that his ex-lover, Maureen is nowhere to be found. And she's not the only one. Dozens of humans and mutants have gone missing, including the mother of a teenage boy, Marcus Baptiste. With Weapon X in close pursuit, Logan and Marcus must team up and follow a trail of clues that leads them deep into the gothic heart of the bayou, where they encounter biker gangs, Cajun thieves and a world of wonders that defies explanation. It is here that they find Greenhaven -- a backwater refuge run by a powerful mutant named Jason Wyngarde." "After seeing the overwhelming support for Marvel's Wolverine: The Long Night, we are excited to introduce listeners to another unique audio storytelling experience," said Dan Buckley, President of Marvel. �gMarvel�fs �eWolverine: The Lost Trail will continue expanding Logan's story and introduce more elements of the Marvel Universe. We look forward to expanding our content for Marvel fans and the scripted podcast community." The show's cast includes Bill Irwin as Jason Wyngarde, Bill Heck as Remy LeBeau, and Blair Brown as Bonnie Roach. Writer Ben Percy, director Brendan Baker and sound designer Chloe Prasinos will return for the series, produced by Daniel Fink and Chloe Wilson of Marvel and Jenny Radelet of Stitcher. The first nine episodes of Marvel's Wolverine: The Long Night are now available on all major podcast platforms and devices. Listeners can tune in to the season one finale on Wednesday, November 7. BUFFY COVERED: BOOM! Studios has unveiled Matthew Taylor's cover to Buffy the Vampire Slayer #2, arriving in stores on Feb. 13. "The reimagining of Joss Whedon's groundbreaking series continues as Drusilla, the self-proclaimed Mistress and her pet, Spike, make their debut with their sights set on Buffy! Meanwhile, Giles is determined to teach Buffy about her destiny, responsibility, blah blah...can someone tell him to chill? How bad can it get?" Other covers are by Kevin Wada, Celia Lowenthal and Audrey Mok. "This is the Buffy Summers you know -- but her world is just a little bit different, which is why we�fre so excited to have Matthew Taylor introduce Drusilla as The Mistress!" said edtior Jeanine Schaefer. "If you were a fan of Drusilla and Spike -- c'mon, who wasn't? -- then you're in for a treat as they come to Sunnydale with much different intentions than you've ever seen before. And maybe some tortured poetry as well, emphasis on the tortured part." Below are solicitations posted for January. Click on the publisher's name for the full listings and look for more listings soon here in The Continuum.